Same old package, but brand new name. Toyota’s TPR-Robina (the artiste formerly known as DJ Robot) now plays the role as a guide, and has received an aesthetics upgrade with a more professional look. The droid has also seen Toyota engineers make improvements such as obstacle avoidance and the ability to operate autonomously. Heck, even the TPR-Robina’s fingers are agile enough to grasp writing instruments in order to hand out some autographs, although I’m not sure how much those autographed items would go for on eBay. This is no dumb machine since it features an image recognition system that reads and understands visitors’ name tags, giving specific directions accordingly. 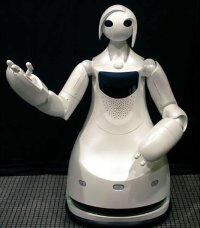 You can check out the TPR-Robina in its new role as a receptionist/guide at the Toyota Kaikan Exhibition Hall on August 27.